India’s prestigious institution Jawaharlal Nehru University is always in news but this time for wrong reason. JNU students have crossed all their limits as they burnt the effigy of Prime Minister Narendra Modi, BJP chief chief Amit Shah, Mahatma Gandhi’s killer Nathuram Godse on Dussehra. When the entire nation celebrated the festival of Dussehra on 11 October, their anger against Pakistan was evident from their burning effigies of ‘terrorists’, but some group of students in JNU felt otherwise. Members of the Congress-backed National Students’ Union of India (NSUI) on Tuesday night celebrated Dussehra by burning the effigy of Modi and others to protest against the growing interference of the Centre in universities and attacks on Dalits. “We celebrated the victory of truth over falsehood in a modern and democratic country by burning effigies. For us Modi and RSS are symbol of untruth,” said Sunny Diman, an NSUI member. 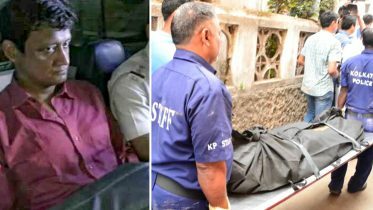 On Wednesday, vice-chancellor M Jagadesh Kumar tweeted: “The effigy burning incident at JNU was brought to our notice. We are investigating the matter and examining all relevant information”. The students maintained that the effigies did not symbolise Ravana – known as the demon king. “There are communities who worship Ram and there are Adivasi communities who worship Ravana also. So, for us it was not Ravana or Ram whose effigy needs to be burnt. We just wanted to symbolize the victory of truth over falsehood,” said Diman. Besides Modi, Shah and Godse, the effigies burnt by NNSUI had faces of Yoga guru Ramdev, sadhvi Pragya, Asaram Bapu and the JNU V-C.
“The effigy-burning was to symbolise our dissatisfaction with the current BJP government. The idea is to root out the evil from governance and bring about a system that is pro-student and pro-people,” said Diman, who was NSUI’s presidential candidate in the recently-concluded JNU students’ union polls. 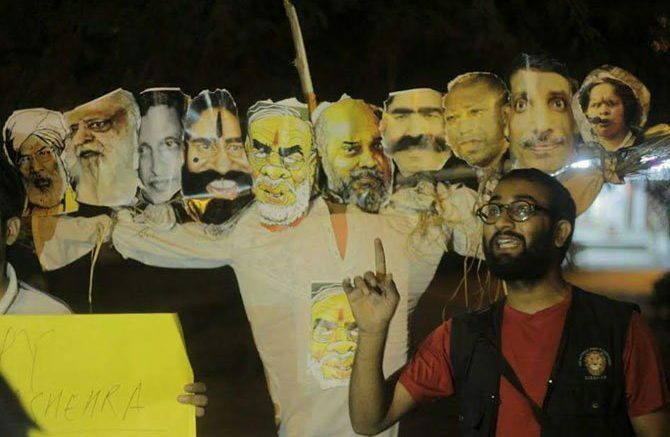 Be the first to comment on "JNU students burnt effigy of PM Modi, Amit Shah on Dussehra"